Chapter 931: He Couldn’t Be The Celestial, Could He? “Who is that guy?” That was what Bai Xiaochun was thinking as Du Lingfei and her group left. His hand still hurt from delivering that slap. It was only now that he realized that the energy passageways in his hand seemed dangerously close to collapsing. “Don’t tell me he’s a demigod? But demigod’s aren’t that tough. Besides, I'm a deva now…. Wait, could he possibly be… the Celestial?!?! Did he slip into the trial by fire to check out the trial-takers first-hand, and see who would be a good apprentice?” The mere thought caused him to shiver with fear. “Impossible. If he were really the Celestial, then why was it so easy to slap him…? Also, if he were really the Celestial, wouldn’t he have exterminated me instantaneously?” After putting some more thought into it, he calmed down a bit, and told himself that he was overreacting, and that the young man couldn’t possibly have been the Celestial. Either way, he realized that his actions before had been too impulsive…. Sighing, he turned and made his way off in a different direction. A few days later, he had left the desert, and was staring out at a seemingly endless swamp. The ground was made up of either sludge, or puddles of bubbling water. When those bubbles popped, they released turbid mist that swirled in the area. As a result, even the sky above the swamp was overcast and murky. He hesitated before entering the swamp; something about it seemed very odd, and the entire place fairly thrummed with vile fluctuations. He immediately felt the need to be more on guard than ever. “This trial by fire is completely bizarre.” He thought about trying to go around it, but the desert was dangerous in its own way, so in the end, he proceeded forward. At the same time, he continued to send out messages with his transmission jade slip. In terms of his own safety, he wasn’t too worried. As long as he was careful, he should be fine. But he couldn’t stop thinking about Big Fatty Zhang, Hou Xiaomei, and his other friends. Every day that they were in the trial by fire alone meant more danger for them. He proceeded through the swamp with the utmost caution, and as a result, didn’t encounter any risks to his life. Before long, half a month had gone by. He did see some dangerous situations. For example, he saw a flock of vicious-looking birds flying in the air. Moments later, an entire horde of leeches shot up into the air and ate the birds alive. He saw tiny larvae swimming in the swamp water, and also saw seven or eight corpses…. Once he saw a huge spider, fully 300 meters tall. It glared at him, but could sense that he was not worth provoking, and eventually sank back down into the waters of the swamp. “This place could be completely deadly to someone in the Nascent Soul stage!” Even as he proceeded along, his mood sinking, he faced the first truly life-threatening situation. A huge, rotten hand burst out of the water like the hand of a giant. Rotten flesh and chunks of coagulated blood flew off of it as it rocketed with lightning speed toward Bai Xiaochun. If it had only been a hand, it might not have been as shocking. But an arm followed the hand, and it was only by drawing upon significant fleshly body power, his Undying Hex, and his newly acquire flying shuttle that he was able to extricate himself from the danger. After reaching safety, a defiant howl echoed through the swamp behind him. “Forget the Nascent Soul stage. This place is even dangerous for devas!” His nervousness and anxiety continued to mount. In the following days, he ran into some other cultivators from the four rivers. Only a few were from the Starry Sky Dao Polarity Sect. However, so long as they weren’t from the Nine Heavens Cloud Lightning Sect, he would still help them as best he could. They were always profoundly grateful, and he would always ask them about Big Fatty Zhang and his other friends. He would even show them pictures he had stored in jade slips. Finally, after relentlessly asking everyone the same questions, he finally found someone who gave him a clue about Big Fatty Zhang! Bai Xiaochun’s eyes immediately began to glitter with cold light. “Two days ago… to the west….” After expressing his thanks, he sped off as fast as he could to the west, sending repeated messages to Big Fatty Zhang along the way. As a deva, Bai Xiaochun could move much more quickly than a Nascent Soul cultivator. Sonic booms stretched out behind him as he shot through the swamp. Not being exactly certain of where Big Fatty Zhang had been, or where he was heading as he was chased, his only option was to search blindly. Big Fatty Zhang was in an area not too far from Bai Xiaochun, huffing and puffing as he sped along, picking leeches off of himself as he went, which was a very painful process. At the moment, he didn’t dare to fly in the air. After being teleported here, things had started out safe enough. With the residual power his Will Core had provided to his nascent soul, he had been able to evade any major dangers. Unfortunately, his actions had attracted the attention of Master Lightning Origin, who mistakenly believed him to be in possession of some extraordinary magical item. 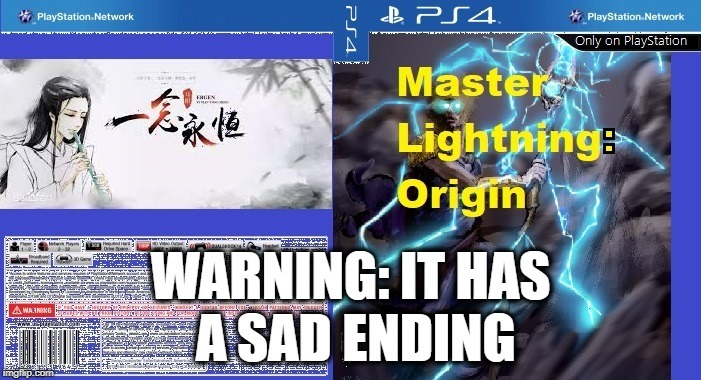 No matter how Big Fatty Zhang had attempted to explain himself, Master Lightning Origin didn’t believe him. Master Lightning Origin’s cultivation base was much higher than his, plus he was accompanied by two other cultivators from the Nine Heavens Cloud Lightning Sect. Just when it seemed like they had been about to catch up with him, he had taken to running on foot through the swamp, and thus escaped them. Unfortunately, running through the swamp caused countless leeches and other vicious entities to swarm him. Thankfully, his Will Core power kept him mostly safe, although he still ended up getting injured, and was still in danger because of Master Lightning Origin and his companions, who continued to give chase by flying through the air. It was now the third day of the chase, and Big Fatty Zhang was starting to lose hope. He was tired, his eyes were bloodshot with fury, and his cultivation base was teetering unstably. He was almost out of energy. Furthermore, things were made more difficult by the fact that he didn’t want to fly through the air higher up, and thus had to brave the dangers of the swamp. On more than a few occasions, he had nearly been killed by leeches…. “What the hell kind of place is this? And what’s the deal with that Master Lightning Origin!? He’s such a bully! !” Big Fatty Zhang was infuriated, but had no options at his disposal. As he fled, he would occasionally try to send messages to fellow cultivators from the Starry Sky Dao Polarity Sect. He was reaching his limit. If it weren’t for the fact that his pursuers didn’t want to go down into the swamp to find him, he would likely already have died. Furthermore, none of the messages he had transmitted had received any responses. He was like an oil lamp sputtering on the verge of going out. Chuckling bitterly, he realized that his speculations had been off, and that he likely wouldn’t make it out of this trial by fire alive. However, that was when a tremor passed through him. His Will Core intuition was telling him that a profoundly powerful entity was making its way through the swamp toward him, and that it was only about 3,000 meters away. From what he could tell, this newcomer seemed like a deva, which meant… that he had no chance of surviving! “Well, if I'm going to die, I’ll take some of them with me!” Eyes flickering with madness, he shot up into the air, which was right about the time that the monkey-like Master Lightning Origin approached, flanked by two other cultivators wearing northern-style robes. At the same time, the air several hundred meters away rippled as a 300-meter-tall spider suddenly reared up from within the swamp! Master Lightning Origin and his companions were clearly shocked, and prepared to flee. As for Big Fatty Zhang, he was just about to try to block their path when, all of a sudden, the transmission jade slip in his bag of holding vibrated. Big Fatty Zhang’s jaw dropped. Facing this sudden chance to escape, he ignored Master Lightning Origin and his companions, threw his head back, and roared at the top of his lungs. His cry echoed out into the ears of Bai Xiaochun, who was some distance away. Stopping in place, he jerked to face the direction of the sound. Then, energy surging, he shot like a lightning bolt in that direction. The will of the heavens stirred, and a huge version of his face appeared in the sky as he closed in on Big Fatty Zhang!